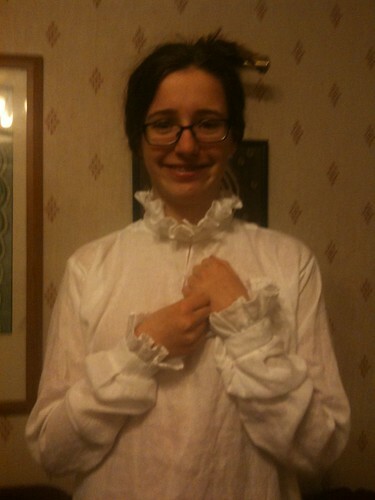 sewing for Kentwell 2013 has begun in seriousness. I have begun a rather posher shift for SB that I hope to take to open day and see what Bess makes of it. Hopefully it wont need too much reworking! If acceptable will then make shift number 2. Have also to make partlet. Clearly currently work in progress and not approved! What makes this shift different? The material is finer, and that it is having frilled cuffs, and then either a square or frilled collar for the neck [Bess's choice]. Much of the construction is otherwise very similar to the other shifts. 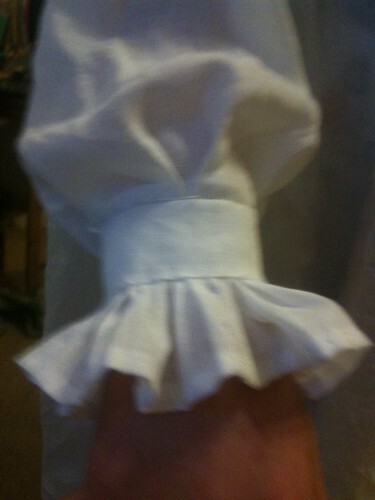 And these pictures show the development of the frilled cuff. I have cut a 4 inch wide band of linen, 1 inch longer than SB’s wrist. this gets folded in 4 along long axis to fin middle, the opened out and each edge folded in to reach the middle. Unlike the collared and cuffed shift this isn’t sewn onto the shift at this point, instead this will envelope the frill. SO another band 3 times the length of this and 2 inches wide was hemmed at sides and along one length. A running stitch of 3/8 along the unhemmed side about 5mm in [i am terrible at sticking to metric or imperial!] 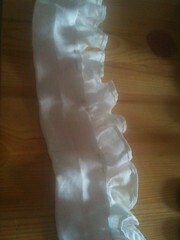 and this was then pulled and finished so that the frill was same length as the band. I then fiddled with the frill to even it out, loosely pinned to the inside of the band and sewed to one side of the band, folded up the other side over, and sewed shut. This means that the raw linen edge is within the cuff band, approx 1cm. The frill + band was then whipstitched to the end of the sleeve, where I had put 3 box pleats to already make the wrist nice and narrow. It has been sometime before I have done more of this shift, but i think i have pretty much finished it now. i have to say a frilled collared neck is a whole new learning game. first takes a lots of trial and error around getting the neck to look good. A lot! I am still not sure I am entirely happy with it, but hey ho… basic premise of the frilled collar is entirely the same as the cuffs. So… for future use, make the neck hole smaller for the posh shift than the poor shift, you really do want it to be close to the neck, this may mean a longer slit down the middle. so cut the smallest neck hole for the size neck you have, make the slits along the top as per poor shift, which will then have a triangular gore in them as per collared and cuff shift. if doesn’t go over head, elongate front slit! 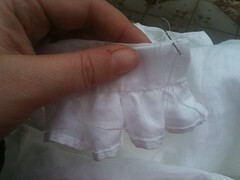 then apply collar and frill. the frill is x3 to x4 for the neck. 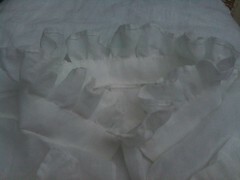 I gathered, tho think pleating may look neater. since my neckhole had been a bit too large, for my ‘bodge’ i elongated the triangular shoulder gores in to take up some of the neck hole, and put a single box pleat at back of neck as well. 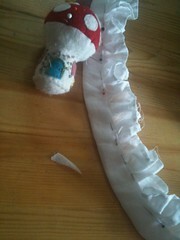 making the neck ruffle – first sewing to inside and then folding cuff over to sew over on the ‘good’ side. I took this to the Kentwell open day where it was perused by 2 elves and deemed ok – phew! with the second shift, i am hoping to make the neck a bit better fit from the start. This entry was posted in clothing, Kentwell 1559, Uncategorized. Bookmark the permalink. I think some very simple blackwork would look lovely on it. Looking really good. Well done. No, I don’t think the band is a bit thick. It fits nicely. Thankyou Bess . very happy!